(November 2103) -- The holidays are fast approaching and plans are being made to welcome guests into our homes as we anticipate celebrating with family and friends. Many Americans are undertaking small remodeling projects in preparation for these special events, and lightweight acrylic block privacy windows afford a number of unique options for making a lasting impression on your guests. Acrylic block door inserts and sidelites from Hy-Lite®, a U.S. Block Windows Company, add privacy while allowing natural light in and through your home. Have you considered dressing up the entry area of your home with a door insert or sidelite? 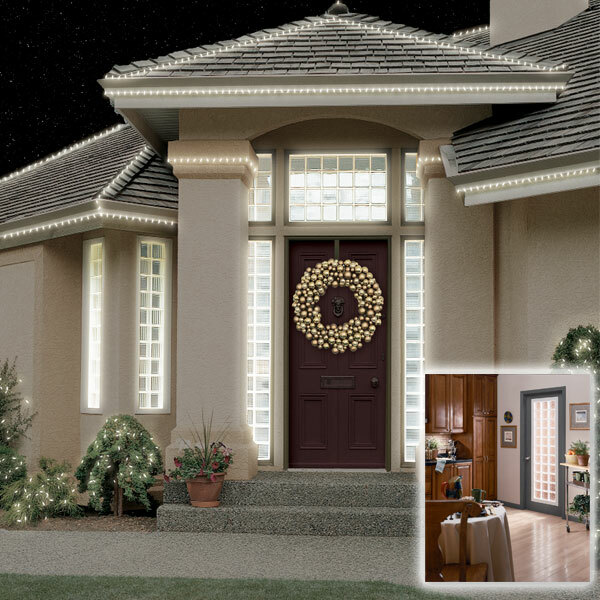 Or, how about adding a decorative accent window to a door or wall in an interior room? Whether adorning an exterior door, or as an insert or sidelite to an interior door, Hy-Lite’s distinctive door inserts and sidelites carry light into rooms without windows, yielding a light-filled home interior. The 6” acrylic block options include clear wave and glacier wave block patterns, and even alternating or uniform cross rib arrangements. The available caulking shades are white and tan, perfect for matching to your interior hues. These can even be ordered as casement or awning styles to allow in fresh air while still protecting privacy. Acrylic Block Door Inserts for Exterior Doors. Hy-Lite’s unique acrylic block door inserts add distinct style and elegance to both new and existing exterior doors at every entrance to the home. Acrylic Block Door Inserts for Interior Doors. Hy-Lite’s acrylic block door inserts borrow both natural and artificial light from adjacent rooms to create unexpected and appealing light-filled accents within the home, offering light and privacy throughout. Acrylic block privacy windows from Hy-Lite feature energy-efficient all-vinyl or thermally-broken aluminum frames, and are available as double- or triple-paned acrylic blocks for enhanced energy efficiency. Pre-framed for easy installation, Hy-Lite privacy windows eliminate the need for window treatments. Acrylic block privacy windows from Hy-Lite are available in a wide variety of standard shapes and sizes for both new construction and easy custom replacement. Hy-Lite, a U.S. Block Windows Company, is the leading manufacturer of acrylic block, glass block and decorative glass windows. To learn more about acrylic block door inserts, CLICK HERE. For a dealer or retailer near you or for more information, please contact us at 888.256.2599.